Los Bajos Puerto Vallarta Dive Site, Save 15%! This is a great dive right at the mouth of Mismaloya Cove. The dive site is only about 500 yards from the beach, but it is accessible only by a short boat ride from nearby Mismaloya Beach. This dive site features shallows and rocky slopes that are the natural habitat for a wide variety of marine life. Your family can relax on the sandy beach while you dive. After your dive, visit one of the beach restaurants for lunch or a drink while you tell about your experience. 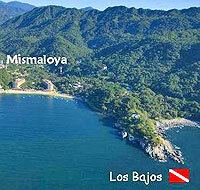 Combine this site with any of the other Mismaloya dives to create your own 2-tank dive! Choose from La Puntilla, Los Bajos, El Acuario, Devil's Canyon, and El Cristo. Just write your choices in the special instructions box when booking. Cruise Passengers: Yes! This tour makes a great shore excursion. Requires: Open Water Certification. 2 Person Minimum. Includes: 1 or 2-tank dive, Divemaster in the water with you, All Equipment, Bottled Water, Fruit, Soft Drinks, Very Small Personal Groups. Departs From: Choose from Marina Vallarta or Los Muertos Pier in Puerto Vallarta's Romantic Zone. Please note that a $2.00 per person marina fee will need to be paid in cash on the day of the trip for Marina Vallarta pick-ups. TO ADD THIS TOUR TO YOUR CART, CLICK "BOOK NOW"
Note: There is a 2-person minimum for this trip. If you are a single diver, please contact us before booking so we can check and see if there are other people signed up that day.